Versatile and timeless, chopsticks are a fundamental utensil for many Asian cuisines. 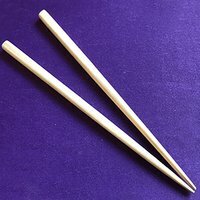 In this workshop led by local woodworker Steve Hatanaka, attendees will create their own personal reusable chopsticks, also known as maihashi. Reusable chopsticks speak to the Japanese concept of mottainai, an effort to not be wasteful. Open to ages 8 and older, but minors must be accompanied by an adult. $12 members, $15 non-members. Museum admission included. Limited to 20 participants. JANM . 更新日 8月 29 2018 9:18 p.m.